April / May 2019 will mark 3 years since the first Disney Minifigures Series was released. Now the wait is almost over for a sequel series. 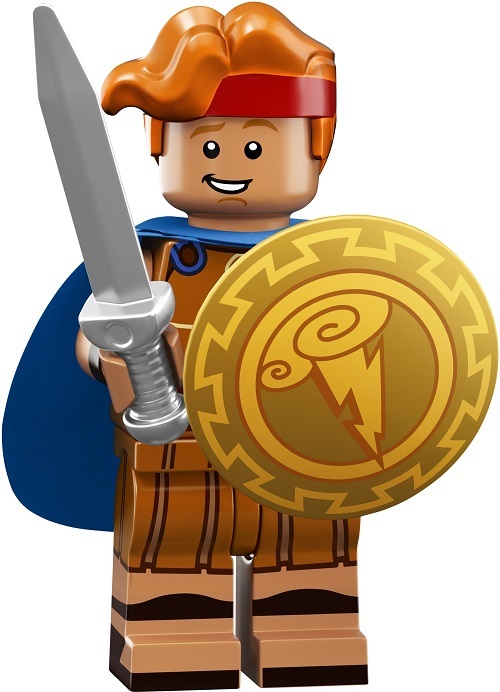 Fans are ecstatic for the LEGO Disney Series 2 Minifigures (DS2) release on May 1st, 2019. The 18 DS2 characters will be released in individual blind packets at the beginning of May and will retail for $3.99 USD, £2.99 UK and $4.99 CAN. The article has been fully updated with eighteen great character descriptions for all the minifigures, along with high quality pictures! 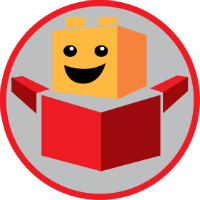 Follow @BrickPals on twitter for breaking news and updates. Share this guide to let others know. The following updated guide is a compilation of everything we know so far, including high quality images of each of the characters. As this is an updated article, we will include ours and the communities early predictions at the bottom of this guide (also check the comments) to see how close they were. So let’s jump right in with what we know about LEGO 71024. The rumours were indeed true! Certain members over on Eurobricks shared that the LEGO Disney Series 2 (DS2 for short) would be the second series of the year, with a release scheduled just two and a half months after the first series of 2019 (The LEGO Movie 2). As you can see, the TLM2 catalogue page actually ‘leaked’ the release date. 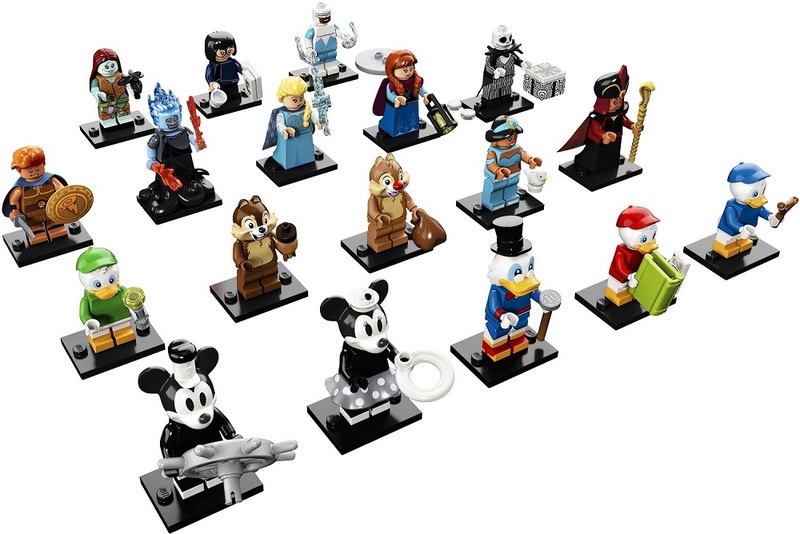 The LEGO Disney Series 2 Minifigures will be releasing May 1st, 2019, with the set number 71024. This means that Series 19 will have the set number 71025 and will likely be released in August / September. Character analysis / descriptions coming shortly. The first minifigure is Vintage Mickey, and wait a minute, doesn’t he look familiar? 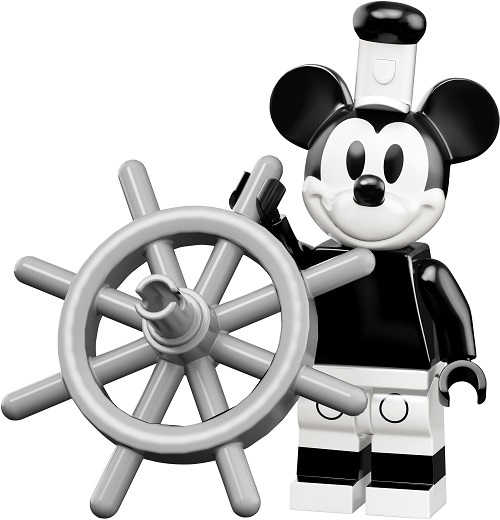 Well, that’s because he is very similar to the figure that just appeared in 21317 Steamboat Willie, the latest LEGO Ideas set! This figure has a black and white design, and seems to sport a new leg design which has three colored sections! His accessory is a boat’s steering wheel which is very large and should make him easy to find in the blind bags. 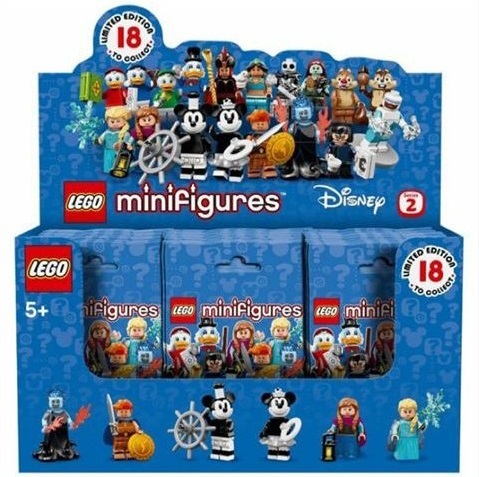 The second minifigure in the set is Vintage Minnie, and just like Mickey, she is also similar to her appearance in 21317 Steamboat Willie! 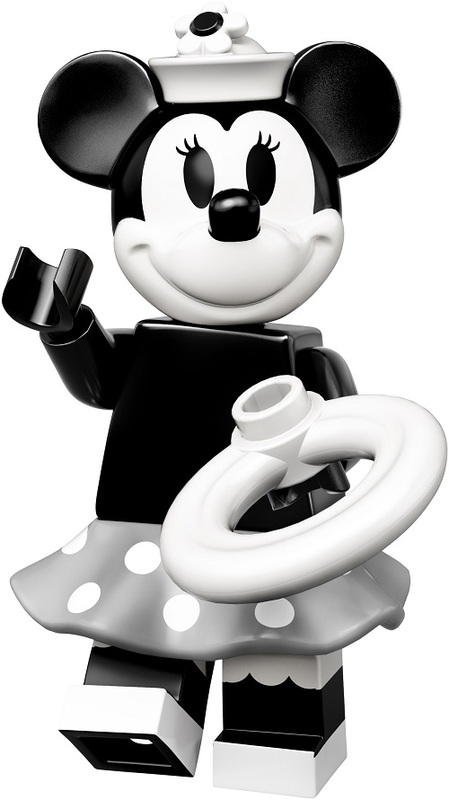 She also has a black and white design, and her accessories are a new dress piece and a white flotation ring – maybe Mickey needs to be rescued! 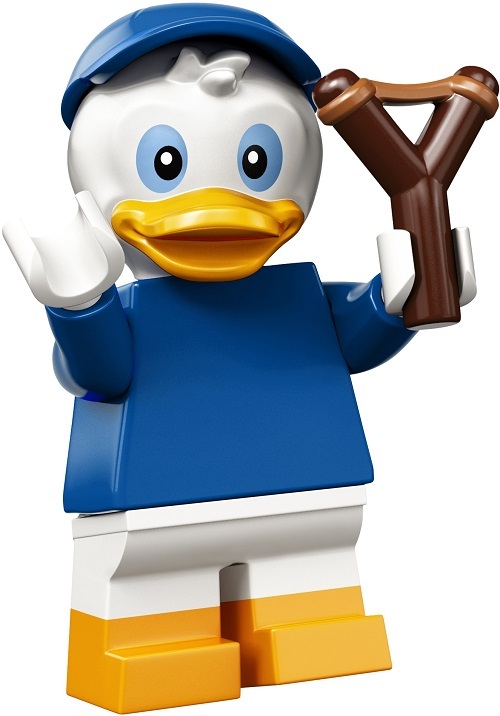 The third minifigure is Scrooge McDuck, who hails from the same universe as Mickey and Minnie. 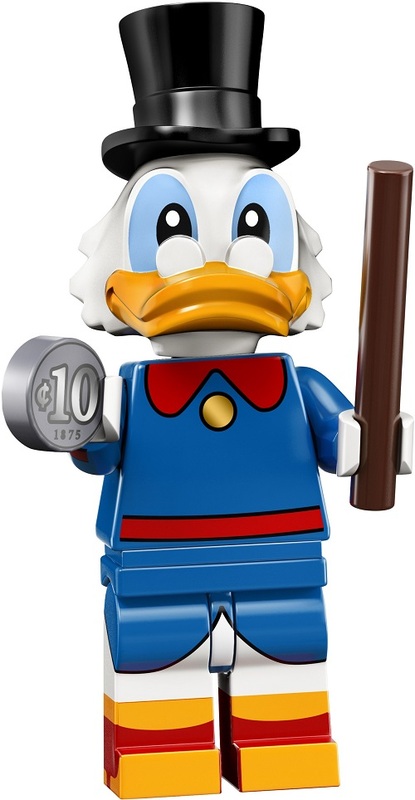 This is the first time we have gotten Scrooge McDuck in LEGO minifigure form, and it is fabulous to finally be able to get this iconic Disney character! He has a new molded head with his signature glasses and hat, and sports a blue outfit. 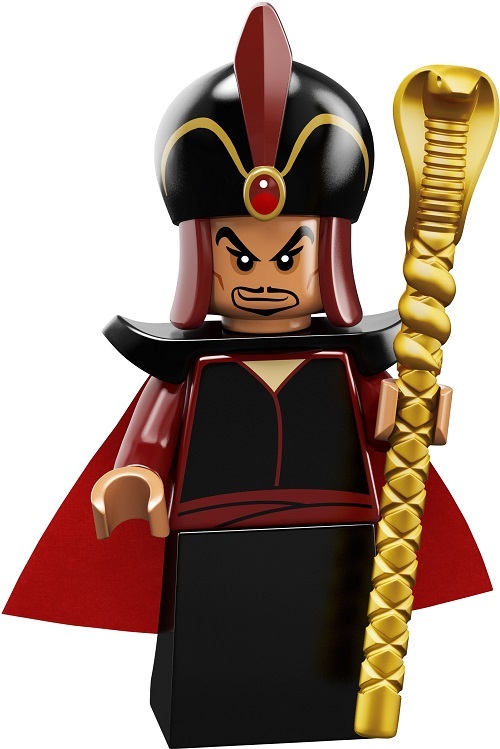 His accessories are a brown walking stick and a printed silver coin, though I’m surprised LEGO didn’t give him a gold coin as his vault is filled with those. Next up we have Donald Duck’s three nephews, the first of which is Huey, aka the red one. I love the three Ducklings and I am so happy to see them in LEGO form. Huey has a plain red torso and a new molded head with red hat. 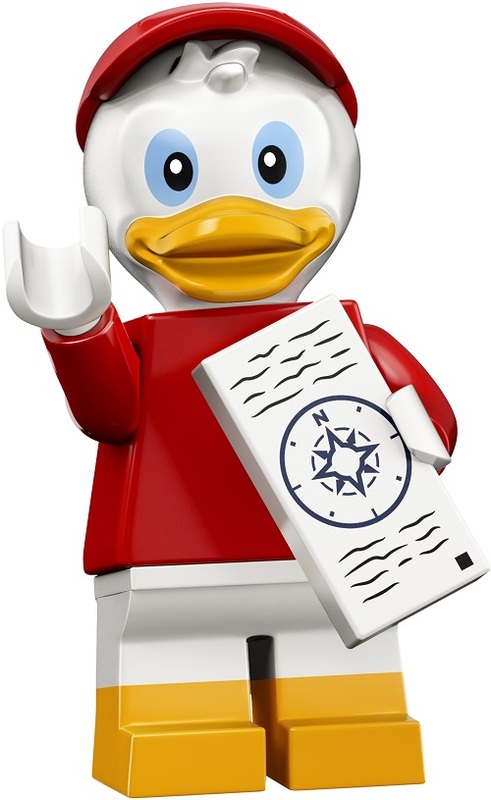 He has dual-molded short legs and has a printed 1×2 compass, along with a green book (not shown). Next up is Dewey, the blue duckling nephew. He has the same head mold as Huey but with a blue cap, and he also shares the same dual-molded legs piece. He has a plain blue torso and a slingshot. The final nephew is Louie the duckling, who has a green color scheme. 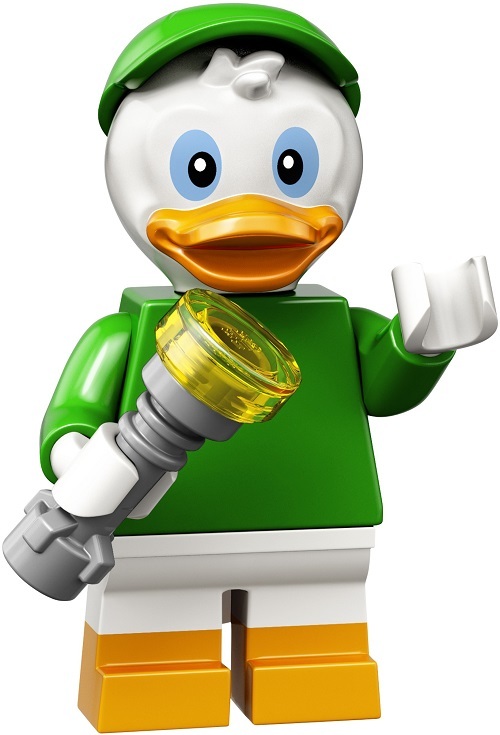 He has the same head mold, unprinted torso, and dual-molded legs as the other two ducklings, but he has a light green color scheme. His accessory is merely a simple two-piece flashlight. Next up is Chip the chipmunk from the series Chip and Dale. I do not know too much about the characters but they are undoubtedly very cute! 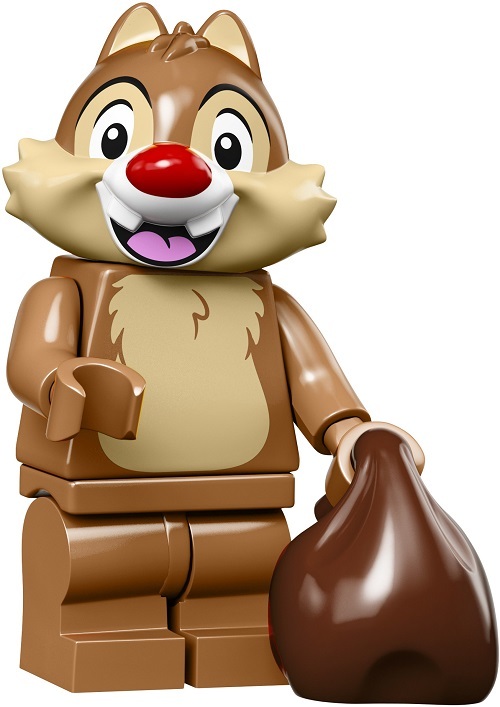 Chip has a darker brown color scheme, along with the new mid-legs in brown and a clever build for an acorn! He also has a new head mold. 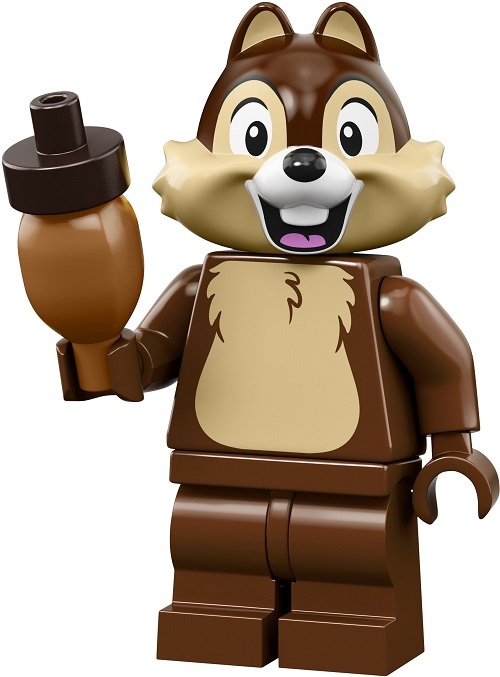 The other figure from Chip and Dale is the other chipmunk himself, Dale. He is a lighter-colored recolor of Chip, and has a predominantly medium nougat color scheme. I think the color works but I think dark orange could have worked too. He has a slightly different head mold (with two molded teeth instead of one) and sports one of the new mid legs in medium nougat. He has a brown bag accessory. Next up is a character from the Aladdin movie – Jasmine! 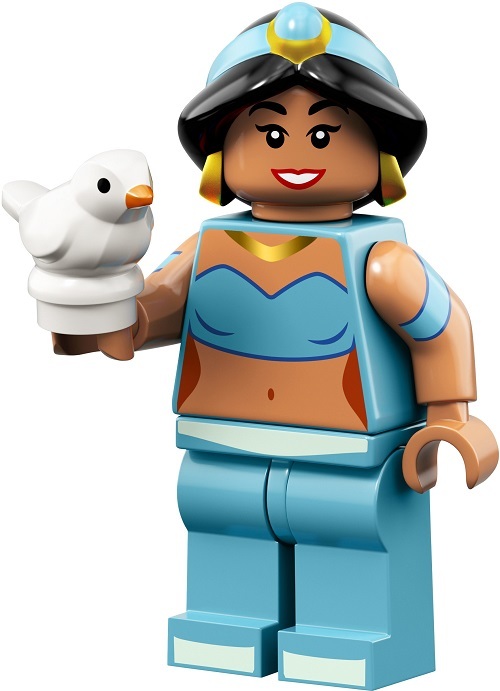 We got Aladdin in the first LEGO Disney Collectable Minifigures Series so it’s only fitting to get Jasmine here. We’ve gotten her as a minidoll before but never as a minifigure so it’s really nice to get her. She has a hairpiece specific to her, along with a new head print that looks good. She has good torso and arm printing, along with some relatively plain legs and a printed white bird accessory. Moving on to the next subcategory, here we have Anna from the famous Frozen movie! 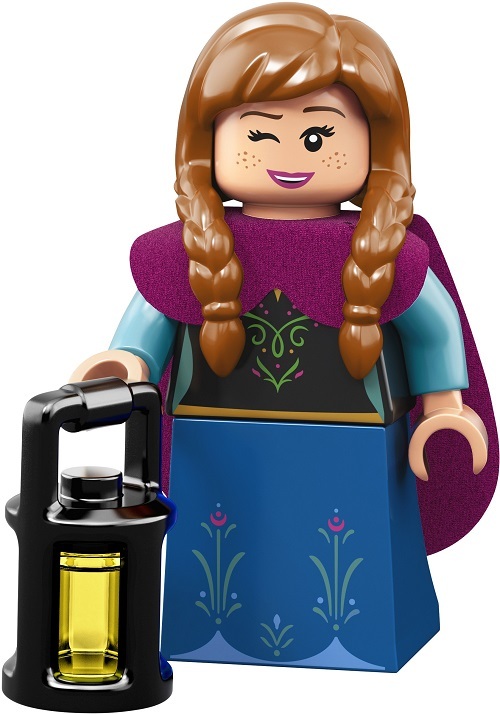 We’ve gotten Anna as a minidoll before but never as a minifigure so she is very exciting to get! She has a new, very accurate hairpiece, a double-sided freckled face, and a brand new dark pink cape! She has a printed black torso and the blue robe dress piece. Her accessory is a lantern, which fits as she carried one in the movie. The other character from Frozen is the ice queen Elsa. We have gotten her in minidoll (and BrickHeadz) form as well but just like Anna, we’ve never gotten her in minifigure form. She has a fabulous new braided blonde hairpiece that looks amazing, along with a new double-sided head that I think looks remarkably accurate. She has a new printed cape that has rounded edges and is printed with glittery snowflakes all over. Her torso and dress piece have great printing too, and she even gets arm printing! 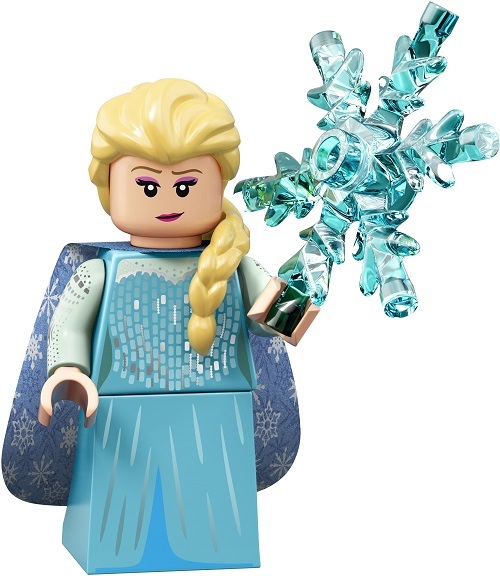 Her accessory is a translucent blue snowflake that looks great. I think this is one of the best figures in the lineup and I anticipate it will sell really well, especially considering Frozen’s success. Next up is Jack Skellington, from the 1993 Disney film The Nightmare Before Christmas. 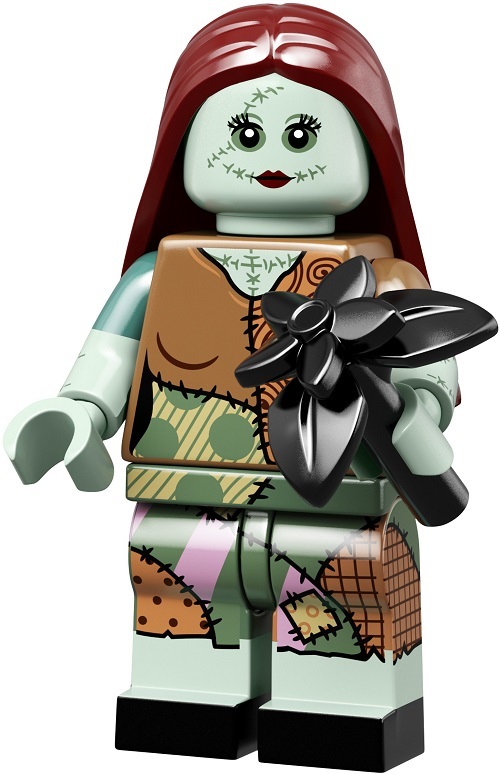 We got Jack and Sally in a BrickHeadz set before, and now they make their minifigure debut! He has a printed skull design that is new, different, and great, and he gets a fabulous new neck collar piece. He has fantastic printing on his torso, legs, and arms, along with a black coattails cloth piece. His accessory is a printed black and white gift box with little clear 1×1 round snowflake tiles. 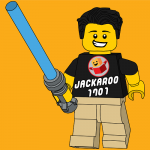 Jack’s skinny body design is not reflected in this minifigure but other than that I think this figure looks remarkable. Accompanying Jack Skellington is Sally, the other main character. She has an aqua skin color which is very accurate, along with a new dark red hairpiece that looks great. She has dual-molded arms to show her short-sleeves, and she even has dual-molded legs with side printing! Her accessory is a two-piece black flower that I think looks very nice. NO CAPES! The next minifigure hails from the famous Incredibles franchise, and it is none other than Edna Mode herself. 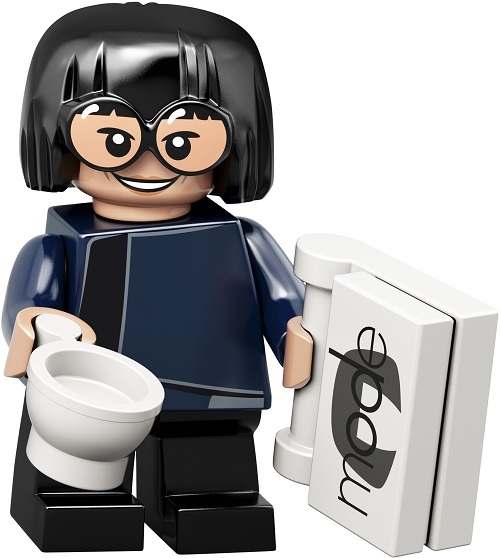 One previous Edna Mode minifigure has been released but many fans disliked that figure as it only used existing molds. This new Edna Mode looks fabulous though, with an amazing new hairpiece that has molded goggles, cleverly recreating Edna’s signature style. She has a dark blue uniform with short black legs, and comes with two accessories: a white teacup and a printed 1×2 tile that says “MODE” on it. The other Incredibles character is none other than the much-loved Frozone, famously inquiring: “Where is my super suit? 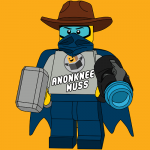 !” This is his minifigure debut and it is simply glorious! He has a printed head and torso, along with dual-molded arms and legs to get that simple but classic superhero outfit. 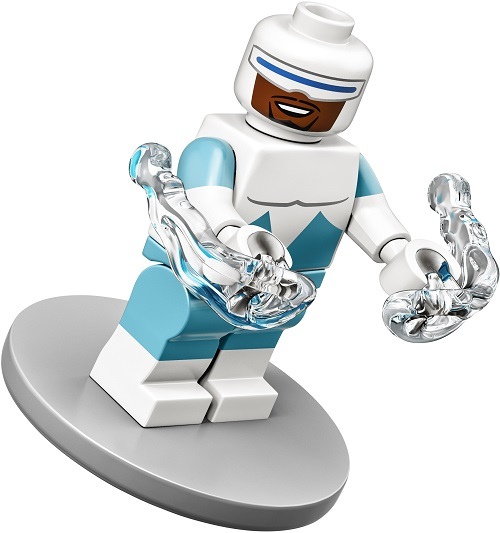 He comes with clear Power Blasts – this is the first time we’ve gotten them in this clear color and this is the first time Power Blasts have appeared in a Collectable Minifigure! Frozone also gets a round 4×4 tile with two studs for a minifigure stand – I believe this is a new piece and it is certain to have very high reusability! The final subcategory in this series is the Hercules movie, and the first figure from the movie is Hercules himself. I have not seen the Hercules movie but I think this figure looks pretty accurate. He has a new molded hairpiece and a new face print, both of which I think look pretty accurate. He wears a pretty darn detailed outfit that I think looks great as well, and has three accessories: a blue cape, a sword, and a new printed shield. 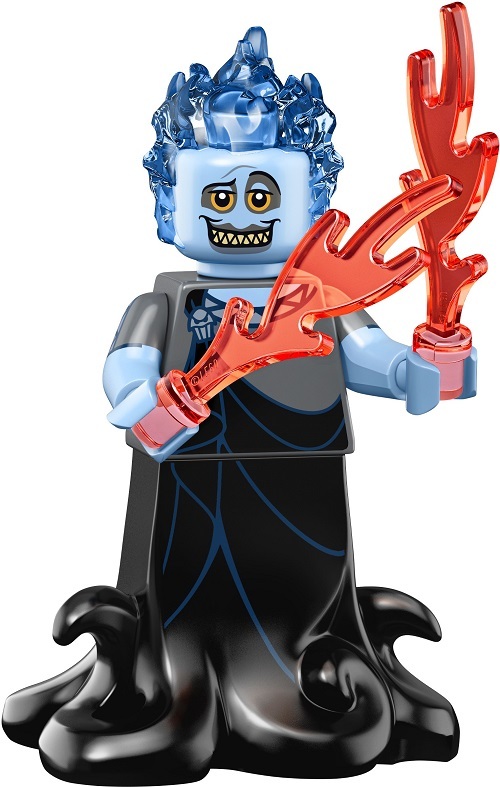 The final minifigure is Hades, the villain of the Hercules movie. He has a blue headpiece that has molded translucent blue flames, and it honestly looks great. Just a heads up to anyone wanting to purchase this figure – the flames cannot be removed from the head piece, but are fused to it. Hades has a dark grey torso with dual-molded arms and two translucent orange flame pieces. He has a new black lower robe piece that looks great, with lots of curled tentacle-like molded elements. Note: The following information was rumoured in November 2018. We’ve kept it live as many fans of the new Disney series 2 may be interested to see early expectations and predictions. 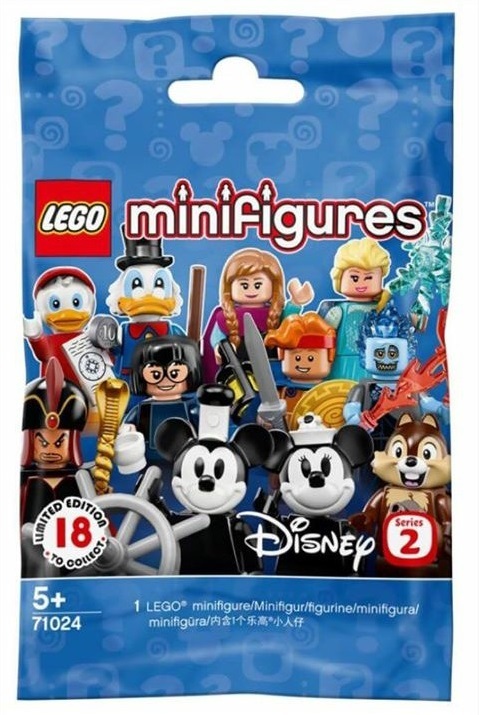 As everyone knows, Mickey and Minnie Mouse as well as Donald and Daisy Duck were all present in the first Disney Minifigures Series. Fans think this means Goofy is a given since he is a prominent developed character in the “MickeyVerse”. Other speculative posts point to Princesses as there was a lacking supply back in 2016. If we do in fact receive Princesses, I believe this will be a much deserved breather from mini dolls and also give the opportunity for fans who don’t like minidolls to fill in gaps in their collection. The long-awaited sequel to Frozen hits cinemas a year from now. 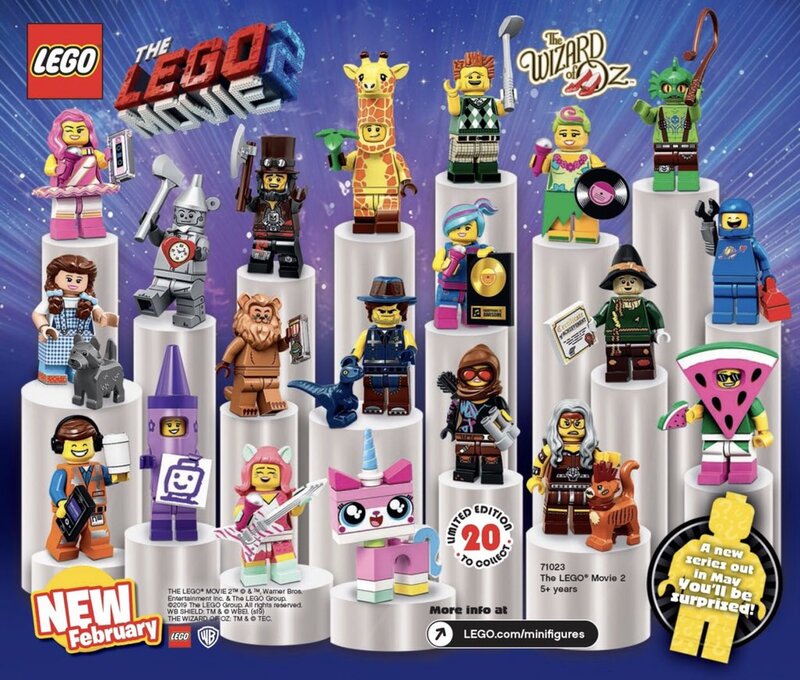 Assuming we will see promotional posters before April, there’s a small chance Frozen minifigures will see the light of day. One thing I’ve learnt from engaging with the community is the collective knowledge of the mutual interest. With Disney, I have came to the realisation how many variants Mickey, Donald and other characters have. 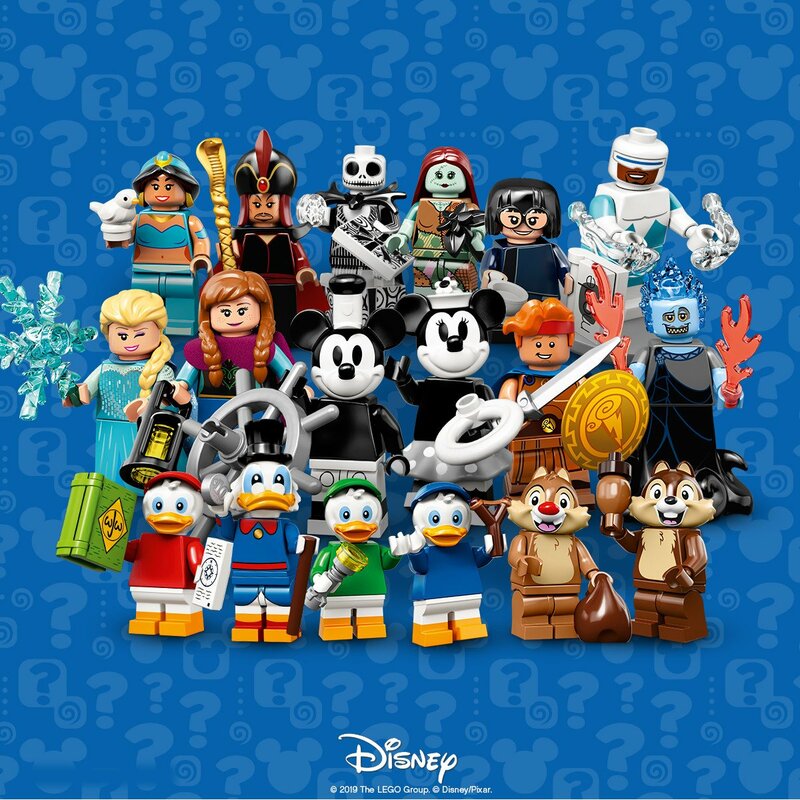 In addition, Mickey is the face of Disney so he is almost a certainty and since Minifigure Series only have original, exclusive characters (at the time of release), Mickey (if appearing) will have a brand new variant. For me personally, I would like to see Mickey Mouse (Steamboat Willie Variant) appear. In the entire history of Collectable Minifigure Series, the only time we have had monochrome minifigures was when the minifigure was a mime or clown. This will not only be refreshing but we will have yet another iconic Disney character! Let us know your thoughts on the LEGO Disney 2 Minifigures Series in the comments below. Thank you so much for reading, until next time my friends! Fans are ecstatic for the LEGO Disney Minifigures Series 2 (DS2) release in May 2019. Find all 18 LEGO 71024 characters with high qualty images. Great list, fingers crossed. I would prefer a Wreck-It-Ralph bigfig but I’ll take what I can get. Thank you for your kind words! Yes I do believe Wreck-It-Ralph sets are extremely unlikely so I’m betting they will be placed in the Disney series. Look at Belle and the Beast, just as the live action film was coming out, Brickheadz was launching its first official wave, so instead of a set or two, Belle and the Beast received the Brickheadz treatment! Sounds like a good list! I’d like Star Wars/Marvel characters (technically Disney, but I know that won’t happen) as I rarely buy sets these days, so CMF’s are a great way to get main characters (like Harry Potter, Ninjago, Batman etc). Thanks Jack, I appreciate your kind words! What do you think about a dwarf? Like Grumpy, Dopey or Doc. We got Aladdin and genie so should do jasmine and jafar etc. Those are some pretty good choices, so here’s my list of some of the disney minifigures that I want to see. Note, this is some of the choices that have been posted on this website to which I would a agree on, and I would really hope that the four legged characters like Simba and Nala would be there. 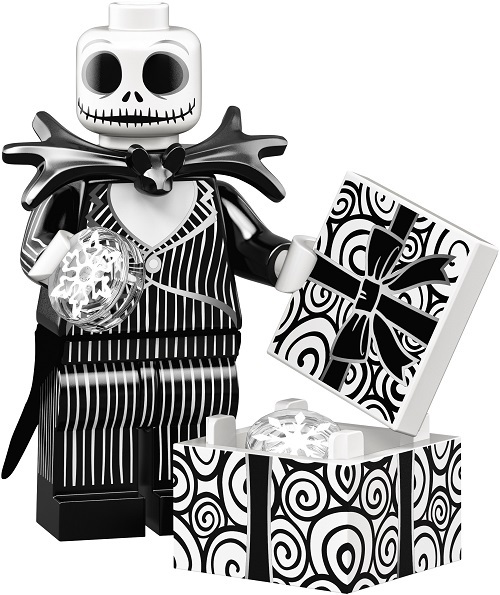 Probably won’t happen, but I’d love to see some Nightmare Before Christmas minifigs in the mix. I put down the real list that I turned it in to the LEGO System company.